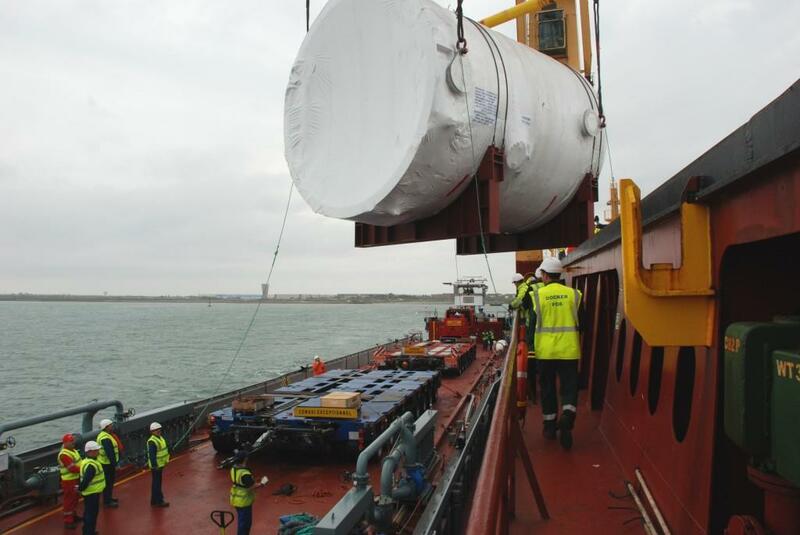 The first two drain tanks for ITER's Tokamak Cooling Water system embarked for their transatlantic voyage from Camden, New Jersey on 17 March. 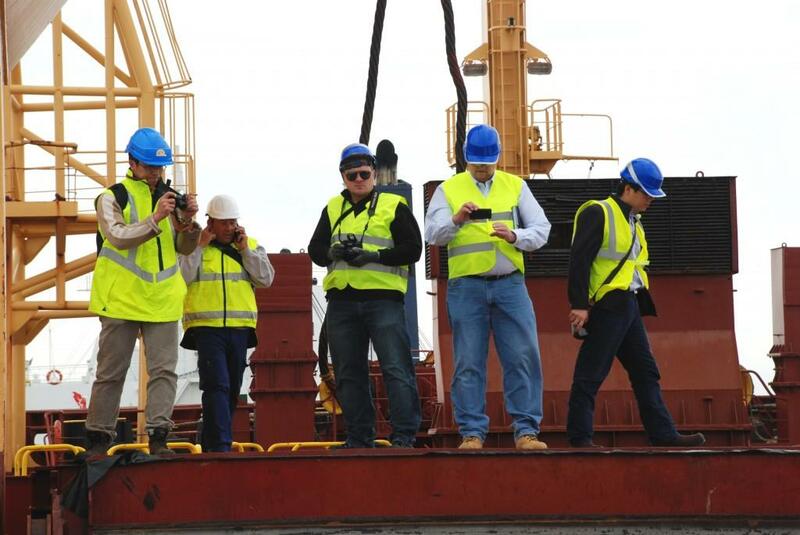 They arrived in Fos-sur-Mer on 26 April 2015. With the wind blowing at more than five knots from the south, the conditions were ideal for kitesurfers. But they were less ideal for the captain of the BBC Zarate, a container ship docked at Fos-sur-Mer, near Marseille. As he followed the wild dance of the kites in the sky, Captain Viktor Malyshev wondered whether he could risk lifting his cargo—two giant drain tanks for ITER, shipped from the US—out of the storage bay. What if one of the gusts were to press the 79-tonne drain tank against the vessel's side before it could be lowered onto the waiting barge? Was it worth waiting for the weather to improve? 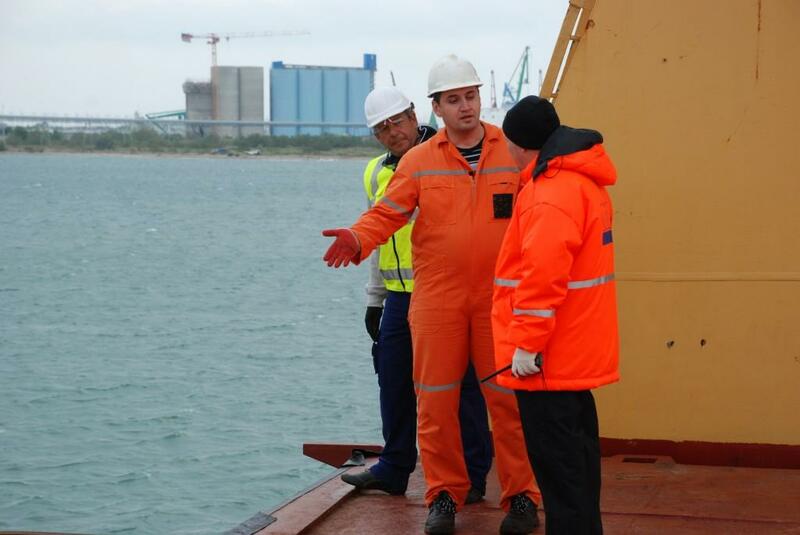 After weighing all of the elements with representatives of DAHER, ITER's Logistics Service Provider, as well as with the crane operator and the deck officers, Captain Malyshev climbed onto the bridge to seek final approval from his shipping company back home in the US. Fifteen minutes later he was back on deck, holding his thumb up: let's go! The action got underway immediately. 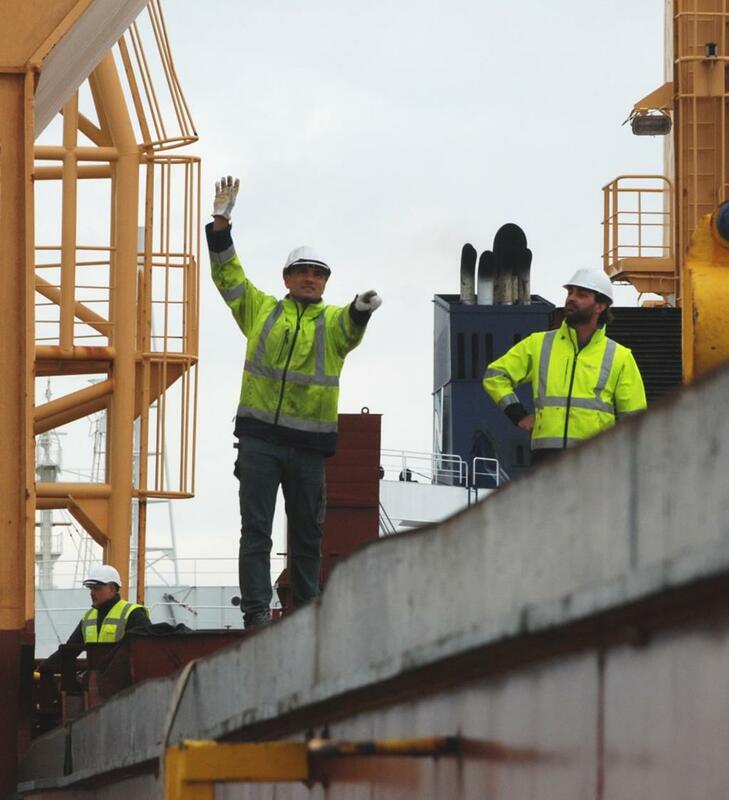 A barge carrying two trucks (that will bring the tanks to ITER Headquarters) was manoeuvred alongside the ship and secured fast. Within minutes, the tanks were lifted safely out of the storage bay and onto the floating convoy. Part of ITER's tokamak cooling water system, the tanks are made of nuclear-grade stainless steel and can hold 231,000 litres of water each. 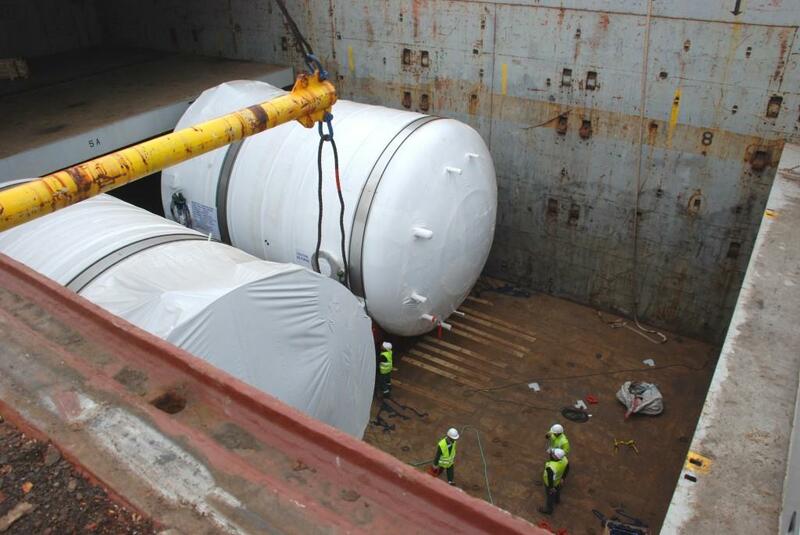 Two other tanks, of similar size, will be delivered shortly in addition to a smaller tank with a volume of 101,000 litres. 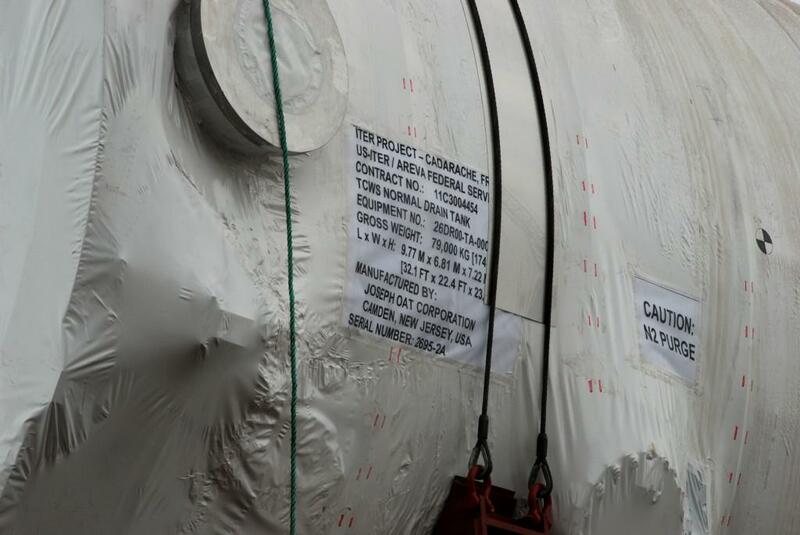 The tanks are among the first large-scale components to arrive on site because they must be installed in the lowest level of the Tokamak Building early in the construction process. The US-procured drain tanks were manufactured at the Joseph Oat Corporation in Camden, New Jersey, under contract to Areva Federal Services. ITER's transport officer Yanchun Qiao, Alain Spatafora from the company E-Surveys, Roy Shearin and Marc Lamarre from US ITER and ITER Cooling Water Engineer Fan Li. The conditions were ideal for kitesurfers on 26 April .. less so for unloading operations. The barge with transport trucks already on board was pushed into position alongside the "BBC Zarate." Captain Viktor Malyshev from St. Petersburg was obviously relieved after the successful operation. Part of the US in-kind contribution to ITER, the drain tanks were manufactured at the Joseph Oat Corporation in Camden, New Jersey, under contract to Areva Federal Services. 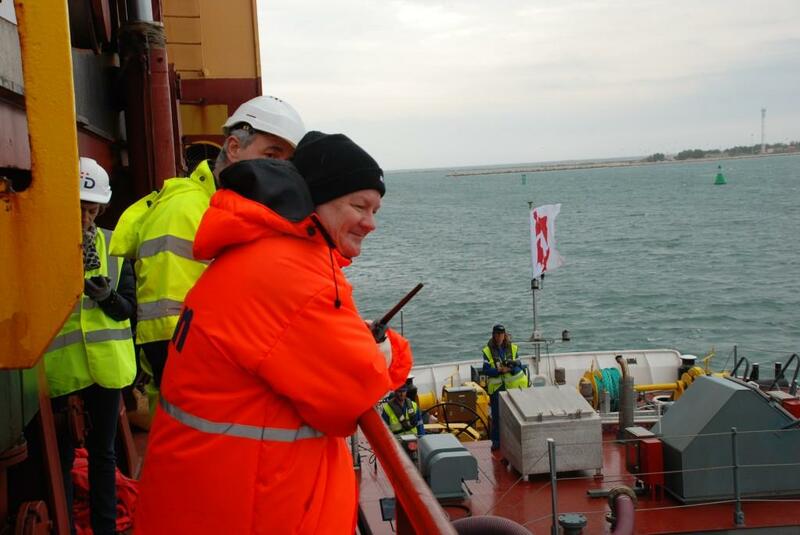 Handling a 79-ton drain tank in a five-knot wind requires a well-coordinated team. The first of two 79-tonne tanks is raised from its storage bay. 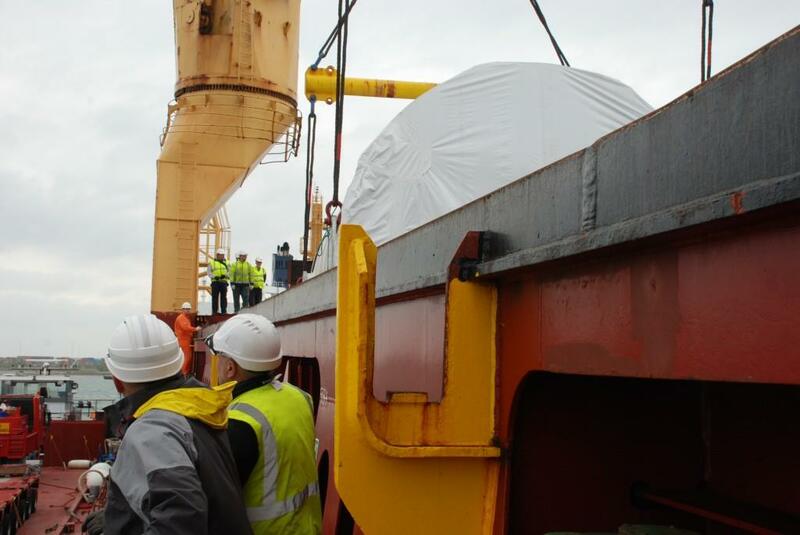 The drain tanks spent more than one month in the hold of the container ship, as it travelled from Camden, New Jersey. 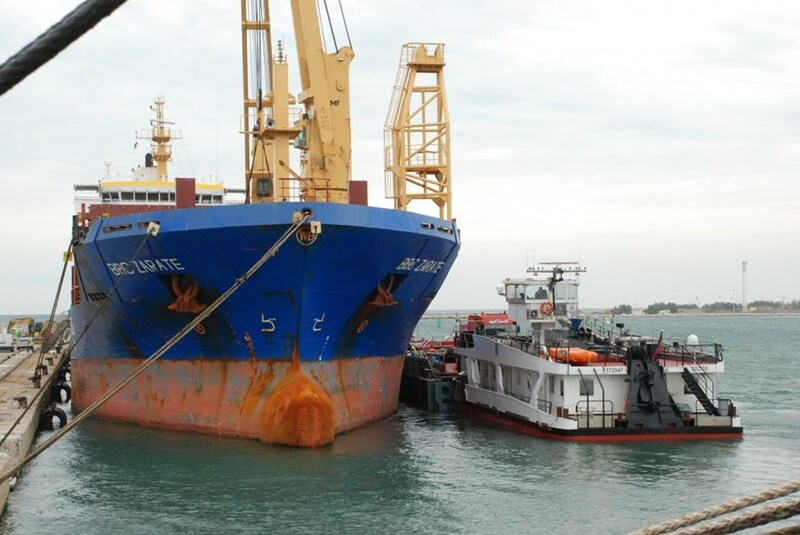 After the final go-ahead from the US shipping company, the action got underway immediately. 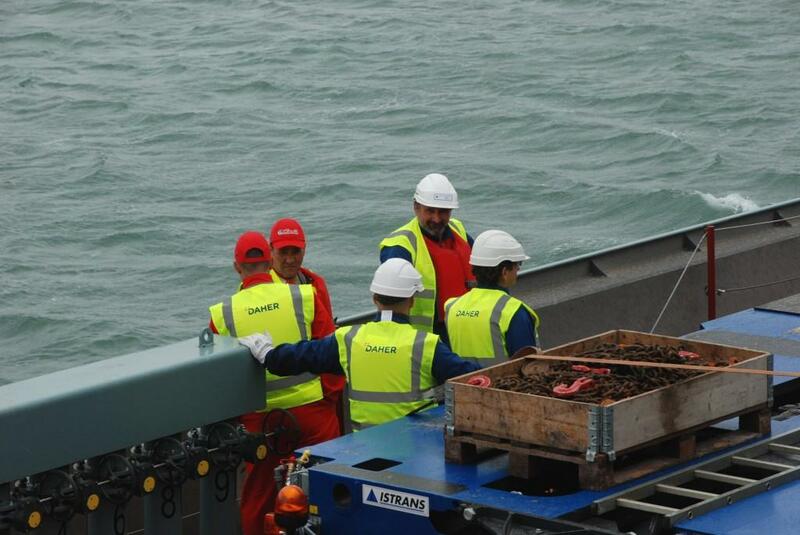 On the barge, the crew and truck operators are waiting for the action to begin. The captain of the "BBC Zarate" (right) discusses the situation with the crew.